Schmid Pilot Production GmbH (SPP) celebrates topping out the Pyrolysis building. Production start on track for March 2010 of monosilane and polysilicon for the Photovoltaic (PV) industry. 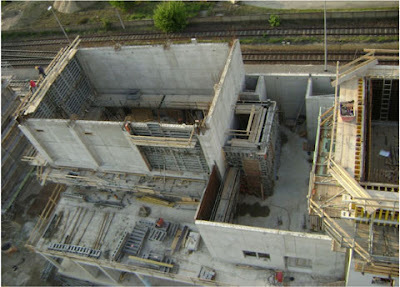 On July 15, 2009, Schmid Pilot Production GmbH (SPP), a wholly owned subsidiary of Schmid Silicon Technology GmbH (SST), held a topping out ceremony for their monosilane and polysilicon pilot production facility. “Schmid-Silizium feiert Richtfest” (Google English) by Mirko Kolodziej for the Lausitzer Rundschau covers the event. SPP annual production targets of 540 MT (Metric Tons) Monosilane (SiH4) and 125 MT Polysilicon remain intact along with the planned €49 million investment. The Linde AG (FRA:LIN) 300 tpa (tons per annum, I assume metric?) silane filling facility is also still planned across the street, Südstraße. The topping out wreath (please see the Richtkranz photo) was hoisted with a crane and placed on a wooden frame atop the Pyrolysis building not the 33 meter high tower. Just the day before, the reactor was delivered in two pieces, a five (5) ton bottom section and a six and half (6.5) ton bell jar. Pictures of the site plan and SPP construction progress can be seen here. At Intersolar 2009, I heard the SPP delay per Schmid Silicon Technology: Schwarze Pumpe production delayed until 2010 caused regional Linde customers to scramble for silane supply pushing prices to the $100 per kilogram (kg) range. In a press conference, Schmid Silicon Technology GmbH CEO Alexander Berg and Schmid Pilot Production GmbH CEO Dr. Josef Biedermann presented Einstellungs- und Baustatus Schmid Pilot Production GmbH „Schwarze Pumpe“ (German only). SPP is intended to validate Schmid’s process technology, equipment offerings, and modular turnkey plant concept while developing a Competence Center, enabling process development, and training customers. A significant portion of the presentation is directed towards filling 74 open positions with qualified professionals and a few trainees. Mr. Berg said the unique Schmid Process would require even experienced professionals to receive special training. 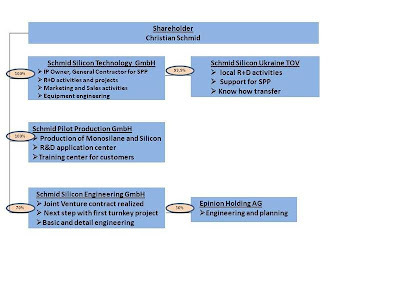 Schmid Silicon Technology has a complex company structure as shown above. Christian Schmid of Schmid Group fame is the supermajority shareholder of the company and its subsidiaries. SST has been busy with PR (press releases) in the past few months although they tend to eschew such visibility. Per “Roofing Ceremony for Pilot Line” (Deutsch), the pilot line should be ready for production in March 2010 with initial monosilane and polysilicon shipments planned for June 2010, and full SPP capacity ramp expected by year end 2010. Before the “Arrival of first Equipment!” (Deutsch), “Schmid Silicon Technology Team supported by Michael Kerschen” (Deutsch) announced Mr. Michael Kerschen, former President and CEO of ASIMI, had joined the Technology Team led by SST COO Jochem Hahn as a multi year consultant retroactive to June 1, 2009. And “Silizium-Fabrik leg los” (Google English) also from the Lausitzer Rundschau reported SSP had received their final approval or building permit on April 18, 2009, weeks after Sunways terminates Polysilicon and Solar Silicon efforts.